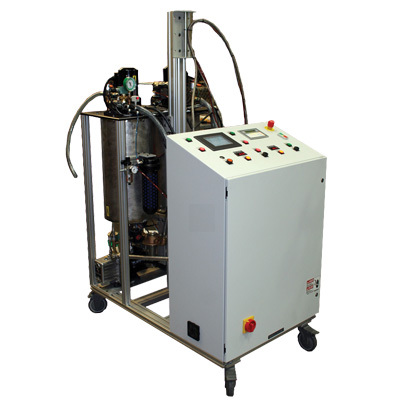 The T-2000 Multi Component Dispensing System is a flexible, digitally controlled, cart-mounted meter mix system featuring Fluid Research’s proprietary positive displacement pump technology ideal for medium to high volume dispensing requirements. It also includes Fluid Research’s proprietary microprocessor controls with a touch pad user interface, capable of up to 40 stored dispense programs coupled with the lowest industry maintenance requirements make this meter mix system the most reliable cost-effective machine available. The T-2000 is a stand-alone or automation integrated dispenser. This is the most popular form factor for nearly all epoxy, silicone and urethane two-part materials. Compatible with Meter Mix units, NeverEmpty™, pail or drum rams.